While each plant is a complete “plant factory” in itself, with built-in nourishment, it is a good idea to mix a quantity of Breck's Food for Bulbs and Perennials with the loose soil at the bottom of your planting. This will provide additional food without any danger of “burning.” Never apply fresh or half-rotted manure directly on bulbs and perennials. As soon as the shoots break through the ground in the spring, repeat the fertilizer application. Do not fertilize spring flowering bulbs after they have started flowering. This tends to encourage the development of bulb rot and sometimes shortens the life of the flowers. Summer and fall flowering bulbs should be fertilized monthly from shoot emergence until the plants reach full flower. The optimum pH range for bulbs is 6 to 7. A soil test of the planting area is necessary to determine if lime needs to be applied to adjust the soil pH. If needed, limestone should be worked into the soil. 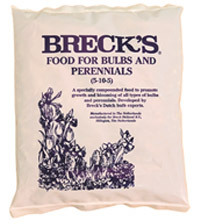 For good bud development, work Breck’s Bulb and Perennials Food into the soil at planting.